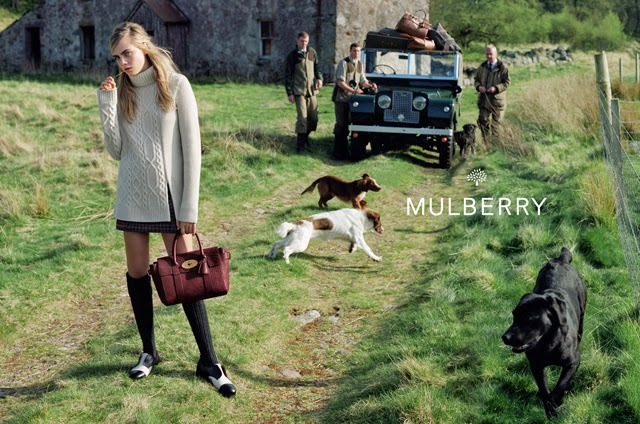 So not only does Cara Delevingne have her own collection now out with Mulberry, she's also starring in their campaign for Autumn Winter 2014. In all honesty, it is a perfect partnership. Cara's bags for Mulberry are impressive, to say the least, and she is the perfect British face to front a global campaign that celebrates the brand's heritage. We can now say Cara is officially in with the berries - Mulberry and Burbery, that is. Truly, it was only a matter of time. Shot in the Scottish Highlands, by photographer Tim Walker, this is a beautiful campaign that celebrates the beauty of the UK alongside a beautiful British brand. Congrats, Cara and Mulberry on the creation of a campaign that makes us want to ditch all other plans and head for the Scottish highlands, with a packed Mulberry bag of course.